MADCAP ENGLAND 'ZIG ZAG WANDERER' MENS RETRO SIXTIES KNITTED CYCLING TOP (Black/Red) - Short Sleeve. Named after the Captain Beefheart track 'Zig Zag Wanderer' from 1967's 'Safe as Milk' album, this fab Retro knit cycling top by Madcap England is a neat play on traditional Sixties Mod dogtooth design. A constant flow of repeated zig-zag stripes in dogtooth form creates a Psychedelia inspired path from funnel neck collar to hem. A vivid Sixties Psychedelic pattern a true Mod Clothing masterpiece. 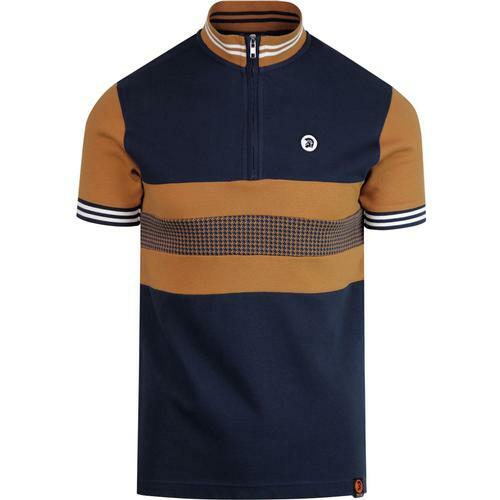 'Zig Zag Wanderer' Retro Knit Cycling Top by Madcap England. 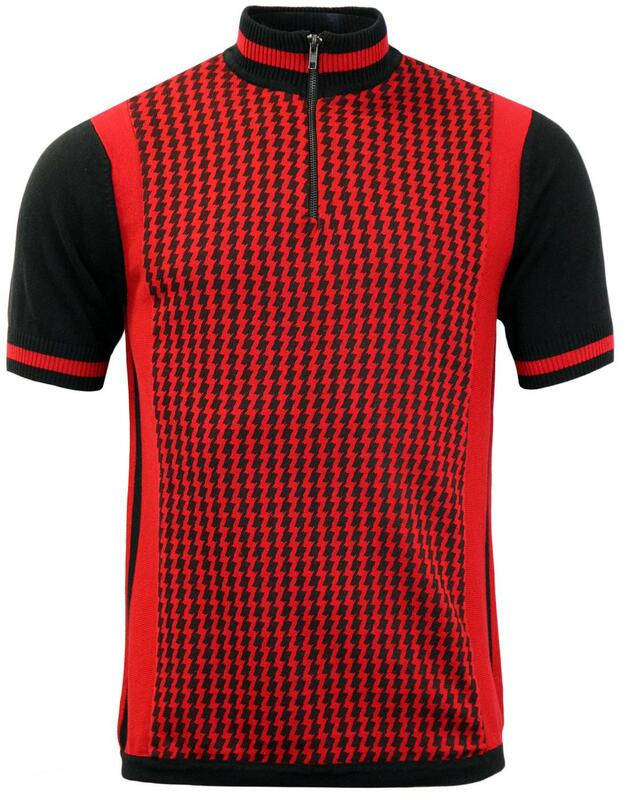 Zig Zag Wanderer Mens cotton knit Retro cycling top in black and red. With cool Indie stripe funnel neck collar, zip placket detail and ribbed trim to cuffs. The red side panel features a cool Retro twin stripe detail in black. Mod Dogtooth Zig Zag print to the front panel creates a cool Psychedelic edge. At home in the 1960s Acid Tests era, Zig Zag Wanderer is a trippy tribute to Mid-Late Sixties fashion culture and a brother to the more traditional Madcap England staple 'Roue Dogtooth'. The Indie distressed nature of the print makes each garment slightly different to the next. 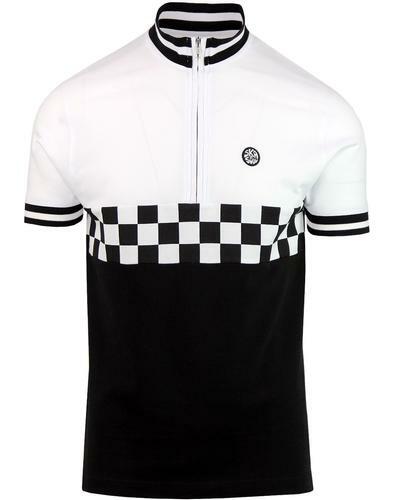 A striking Madcap England Retro Cycling Top - Zig Zag Wanderer! 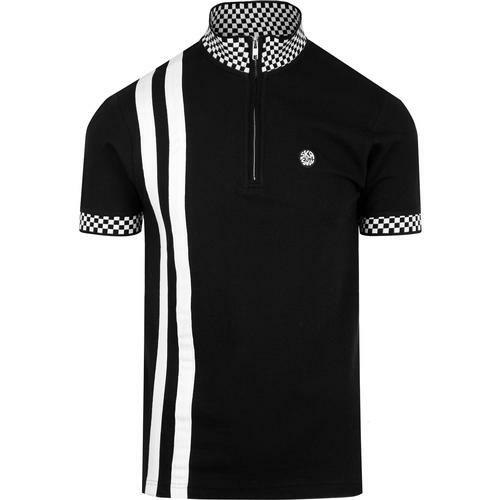 MADCAP ENGLAND 'ZIG ZAG WANDERER' MENS RETRO SIXTIES MOD KNITTED CYCLING TOP. Composition: 100% Cotton with front panel print. Care: Machine wash inside out. 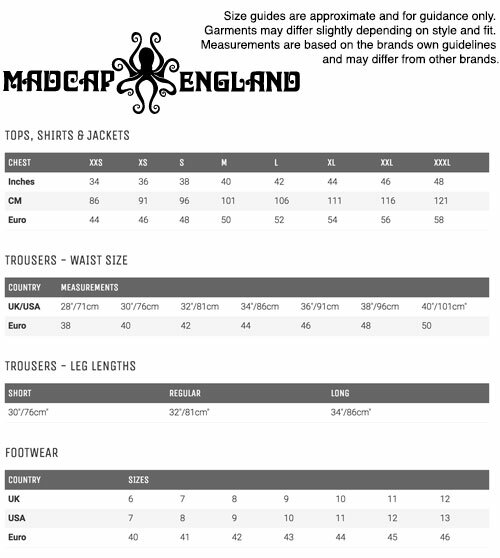 Please refer to full instructions on garment care label. 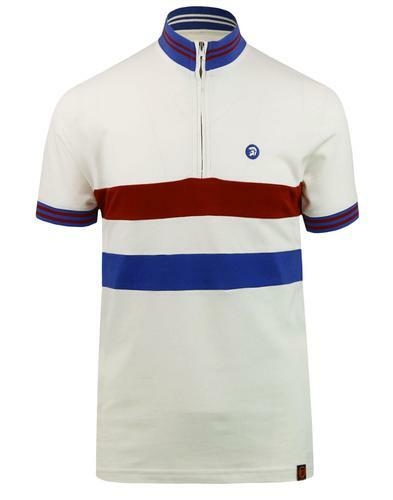 SKU: MC132 'Zig Zag Wanderer' Madcap England Cycling Top. MADCAP ENGLAND 'Zig Zag Wanderer' Mens Retro Sixties Mod Knitted Cycling Top (Red/Black). Slim fit Mens Mod Cycling Top. Choose chest size to fit.